Behavior and reproduction: The typical call of the common sunbird-asity is a high-pitched string of notes that sounds like "seesee-see-see-see-see." The call can be heard from 150 to 300 feet (50 to 100 meters) away. Male common sunbird-asities, curiosity-driven, will often approach to within a few feet of a human being. Andrianarimisa, A. "A Record of the Sunbird Asity Neodrepanis coruscans in the Réserve Spéciale d'Ambohitantely." Newsletter of the Working Group on Birds in the Madagascar Region 5, no. 2 (1995): 8-9. Hawkins, F., R. Safford, W. Duckworth, and M. Evans. 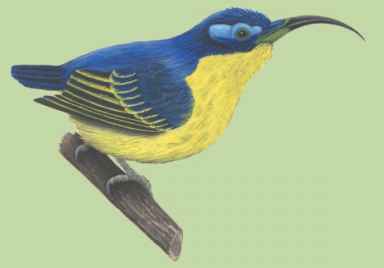 "Field Identification and Status of the Sunbird Asities Neodrepanis of Madagascar." Bulletin of the African Bird Club 4 (1997): 36-41. Prum, R. O. "Phylogeny, Biogeography, and Evolution of the Broadbills (Eurylaimidae) and Asities (Philepittidae) Based on Morphology." Auk 110 (1993): 304-324. Prum, R. O., and V. R. Razafindratsita. 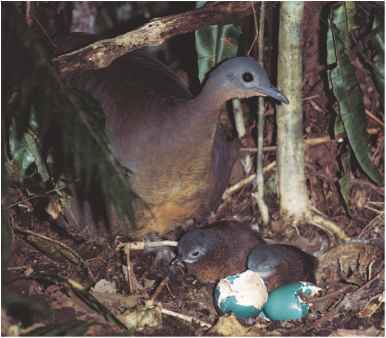 "Lek Behavior and Natural History of the Velvet Asity Philepitta castenea." Wilson Bulletin 109, no. 3 (1997): 371-392.